We have Seniors, Juniors and Mini rugby sections and welcome everyone young and old alike. We have a friendly and fun environment with a strong coaching and management team. Please see the Contacts page for our contact information and club location. During the season the Junior club trains and plays on Sundays from 10am until 12 midday. To keep fit there is Touch rugby, played every Wednesday evening from 7:45pm to 9pm all year round, and all are welcome. You do not need to be a Haslemere RFC member to play Touch rugby. Find us at Woolmer Hill Sport Ground, GU27 1QA. Since our first game in October 1950, the club has enjoyed a proud tradition of being among the friendliest and most sociable of rugby clubs. Whether you are a parent who wants your children to enjoy the fun that rugby can bring, or a talented aspiring first team player, or someone who just wants to trot round a rugby pitch between closing time at lunchtime and opening time in the evening... you will find many like minded individuals with similar aspirations. From the age of 6 to our Seniors veterans team, we run more than 15 teams, so there is bound to be somewhere for you to slot in. We have some of the best pitches in the South of England at our disposal, including a floodlit training pitch which is used on Mondays and Wednesdays, as well as a superb bar and social area which is the envy of many other clubs who come to visit. This is an ideal place to watch international matches on the clubhouse’s big screen. We thrive on the volunteer ethos across the whole club, and encourage everyone to pitch in and do their bit. As an example, there are now more than 50 accredited coaches across the whole spectrum of the club, many of whom unwittingly brought their sons up to play and then got caught by the enthusiasm of the membership. There is also a serious side to the club, and we take such issues as child welfare and health and safety extremely seriously. That is why we are one of only 15 or so clubs in Surrey to have been awarded the RFU’s “Seal of Approval”, an accreditation which demonstrates that the Club has met some pretty stiff standards to show that we have proper procedures in place. One of the key objectives for the Club is to ensure that player welfare and safety is maintained. Besides the normal frivolity which accompanies the very serious aspect of playing rugby, the Club enjoys an active social programme, culminating in a May Ball at the end of each season. The Seniors have been on tour every year since the early 1980s (sometimes twice in the same season), and usually return with the same number we set out with…..Many of the mini and junior age groups also go touring these days. 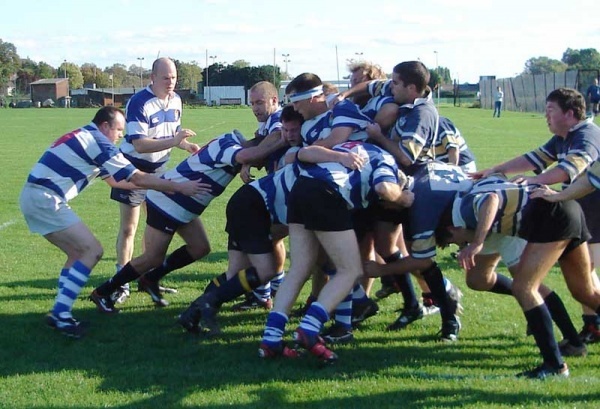 So if you live within the Haslemere area and are looking for a rugby club, look no further. Come up to Woolmer Hill, or give one of us a ring to find out more.